Anstey Lwanda is a health surveillance assistant (HSA) in Kwitanda, Malawi. Married with two children, Anstey is from a village in Ntcheu district, a district neighboring Balaka where she now lives and works. Having completed Form 4 of primary school, Anstey received eight weeks of training to be a community health worker and has worked as an HSA since 1999. Anstey became an HSA because she wanted to help people and help her friends – both of which she now does. When she was 22, she started working at the Balaka Town Assembly. In this position, she focused on sanitation work in mostly urban areas. Even though it wasn’t part of her job, Anstey regularly went on her own to under-five clinics in rural areas. There, she would work with HSAs to keep up her skills so that someday she could support these communities on her own. In 2006, Anstey made a career shift to become an HSA. She now works in Kwitanda, where VillageReach supported a training to certify Anstey and several of her colleagues in the integrated management of childhood illness (IMCI) – an international protocol of both preventative and curative measures to promote the well-being of children under-five. One of Anstey’s primary responsibilities is to run a village clinic that is in part funded by VillageReach. She operates the clinic, which supports four villages, two days per week. While Anstey has treated cases of diarrhea, pneumonia, and conjunctivitis, most of the children she has seen presented with malaria. 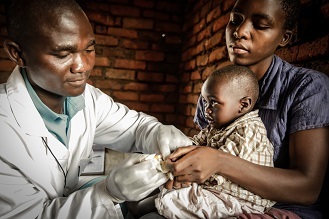 Every year, more than 6 million people in Malawi contract malaria. The infection kills nearly 800,000 children around the world every year, despite it being completely preventable and curable. In 2008, malaria rates for children under-five in Malawi were over 100% because some children contracted the disease twice. Extending treatment and prevention services through village clinics – like Anstey does – helps to increase access to quality services in otherwise underserved communities. In addition to operating a village clinic, Anstey operates under-five clinics six times every month with her colleagues. On the days Anstey is not operating a village clinic or an under-five clinic, she goes into her catchment area to do home visits, treat water, inspect villages, meet with Village Health Committees and bicycle ambulance committees, and supervise the bicycle ambulance. She travels there by bicycle from her home, which is about fifteen minutes away. 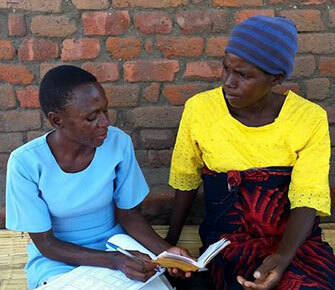 “The place I live is far from where I work,” Anstey says, “If I lived in my catchment, I could do the Village Clinic every day.” On other days, Anstey travels even further – several times a month she makes the thirty-minute trip to Kwitanda Health Center for data collection and reporting. Learn more about VillageReach work to improve access to quality healthcare through innovations focused on human resources for health.